Here we define the tax base amount that will be subject to tax and the perentage of the tax that will be applicable for calculating the tax on the base amount. • You can define tax codes that contain both the basic tax and the surcharge tax. • You can define separate tax codes for basic tax and surcharge tax respectively. Some tax offices prefer you to show surcharges separately from basic withholding tax; others prefer the two to be rolled into one. You cannot customize this information at business place (tax office) level, so we recommend that you use the method that is preferred by the majority of your tax offices. For each company code, specify which method you want. Under this option we have to either tick the box against each company code or leave it blank. 1) Check box ticked: Means Separate tax types and tax codes for basic withholding tax and surcharge. 2) Check box not ticked: Combined tax types and tax code for basic withholding tax and surcharge. In this IMG activity, you maintain the tax codes that you want to use for surcharges. 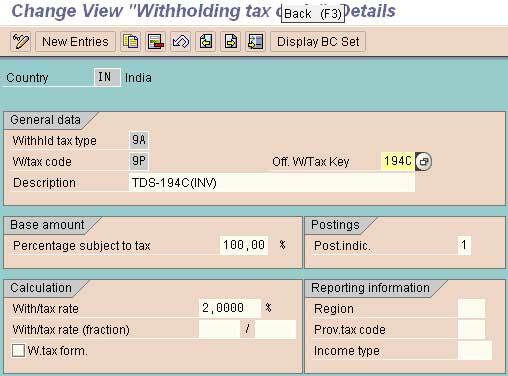 In this activity the withholding tax types are defined to company codes. Activate the W/Tax by clicking the box opposite to the company code. Any kind of document type can be used. In this activity we define the number range against each number group and that will be used by the remittance challan. Select task group from task bar. Change the tax to be used by selecting the maintain tax from the drop down menu Group. Select the group to which the number range to assigned by clicking the box. Go to the option maintain interval through the drop down menu as shown above. Maintain the number range that is to be used. In this activity we define which SAP script forms the business would like to use for printing the tax forms for customers and vendors. In this IMG activity, you assign a number range (through a number key) to each number group that you have defined in the previous activity. Once the Tax Codes ad Tax Types are assigned to the vendor master records the system will calculate the TDS automatically when the bill is posted. The TDS so deducted should be remitted to the Govt. To remit the TDS to the Gvt following procedure should be followed.